We are a recognized Health Care Sharing Ministry under the Affordable Care Act. We consist of a national, faith- based membership of individuals and families who share the same ethical or Biblical beliefs and abide by the Altrua HealthShare Statement of Standards. Our members share each other’s medical needs by voluntarily sending monthly contributions to be placed in an escrow account from which members’ eligible medical needs are shared according to our Membership Guidelines and Escrow Instructions. * All medical needs are processed according to our Membership Guidelines. To date, all eligible medical needs have been shared on behalf of members by Altrua HealthShare. 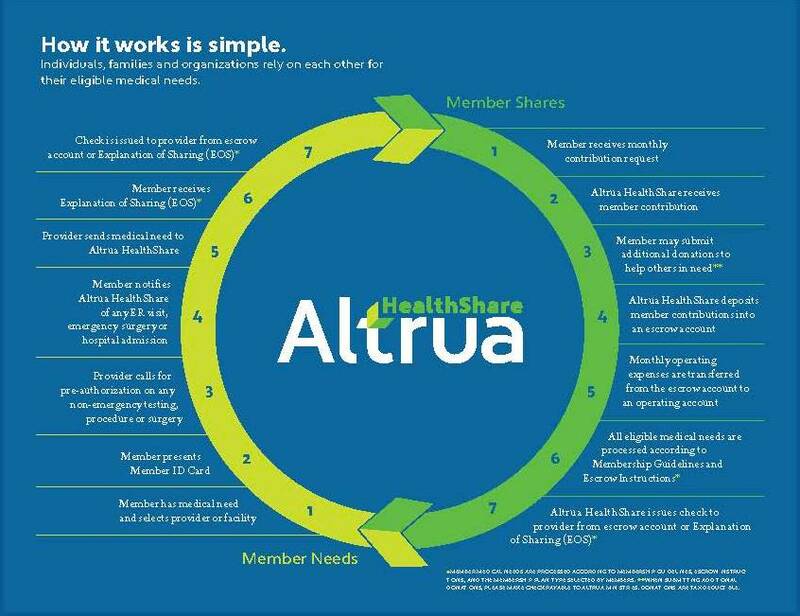 ANYONE- SEE MEMBERSHIP PLANS AND COST - Altrua HealthShare is for anyone looking for health care and shares our Statement of Standards. ARE MATERNITY NEEDS ELIGIBLE FOR SHARING? YES The Gold and Silver membership plans share in eligible maternity needs for those who have been in a combined membership for a married individual for 10 consecutive months prior to conception. If a life-threat- ening condition occurs, normal MRSs are applicable. DO MONTHLY CONTRIBUTION AMOUNTS FLUCTUATE EACH MONTH? NO Our member’s monthly contributions are subject to review. Periodic adjustments may be made-typically on an annual basis to meet the needs of the membership. WHAT MEDICAL NEEDS ARE ELIGIBLE TO BE SHARED BY MEMBERS? SEE MEMBERSHIP GUIDELINES Altrua HealthShare processes all medical needs according to the Membership Guidelines. Membership Guidelines can be downloaded from www.altruahealthshare.org. IS THE ALTRUA HEALTHSHARE MEMBERSHIP INSURANCE? NO Altrua HealthShare is not insurance, does not collect premiums, make promise of payment, or guarantee that your medical needs will be shared by the membership. Sharing of eligible medical needs is completely voluntary among the membership. Member contributions are used to share in eligible medical needs as directed in the Escrow Instructions. * Members of Altrua HealthShare are self-pay members. ARE MEMBERS EXEMPT FROM THE AFFORDABLE CARE ACT? YES Altrua HealthShare is a fully recognized Health Care Sharing Ministry. Our members are eligible for exemption from the federal “penalty” imposed on individuals who don’t have health insurance.